The Long, Slow Goodbye | American McCarver. Your Sports Blog. The New York Islanders all but left town last night. Their contract runs until 2015 and after that they will surely leave but in the hearts and minds of Islander fans, they’re already gone. We’re preparing for a funeral that is going to be four years in the making. The voters of Nassau County made it clear. Their partisan politics got in the way of facts and figures and reality and the majority of residents - at least those who bothered to come out and vote - gave the New York Islanders the finger while they cast those votes. They don’t want hockey here. They don’t want the Coliseum. They don’t want to better their community. There’s no other conclusion I can draw for this. This is a sports blog and I won’t bother you with the economic fallout of this vote. My anger is over here. My sadness, it’s right here. My sadness is for my hockey team. I cried before I went to sleep last night. I sat in front of my computer and watched the twitter stream of my fellow hockey fans as we all found out the results together and I cried. No matter what happens with the Coliseum, no matter what they decided to do with that land now, the Islanders are going to leave. They haven’t been such a great team lately. But they’re getting better. So much better. Watching them grow into a playoff team has been exciting. Watching the young players, knowing they are going to lead the team to future greatness, that’s such a tremendous part of being a sports fan. And they’re going to have to do it with this team. Because what player is going to sign with the Islanders now that their future is so up in the air? This is our team. This is the team that’s going to carry us for the next four years as we prepare to say goodbye. Now with each game, with each win, with each step toward regaining the power they once held over the NHL, there will be a pervasive sadness to go along with the cheers. Every fan who sits down to watch a game in the Nassau Coliseum will be thinking the same thought: This is all going to be gone. Those banners hanging from the rafters? The four Stanley Cup banners, the conference banners and division banners, the banners with names like Bossy, Gillies, Nystrom and Smith? They will be hanging somewhere else. Maybe Quebec. Maybe Kansas City. Maybe even just next door in Brooklyn. 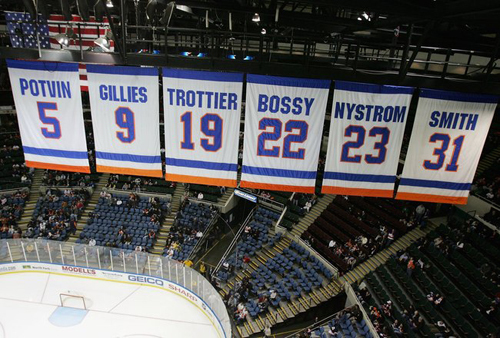 Wherever those banners hang, even if that place is still in New York, it won’t look right. It won’t feel right. Those championships were born and raised on Long Island. Those Stanley Cups were fought for in the Nassau Coliseum. Those banners belong to us, the fans, as much as they belong to the team. To think of those blue and orange numbers hanging from the rafters in a Quebec arena is heartbreaking. There’s a sticker on the back of my car that says “We’re all Islanders.” I wish everyone felt that way. I wish the people who went to the polls last night to vote no thought of us as a community rather than a bunch of disparate towns whose people are only brought together by identity politics. Maybe they don’t remember the parades down Hempstead Turnpike. Maybe they don’t remember the pride of being home to an NHL dynasty. Maybe they forgot that the centerpiece of the team’s uniform is a picture of Long Island. We’re all Islanders. Don’t we all want what’s best for our communities? Perhaps not. So how do you root for a team that you know is going to leave you? Four lame duck seasons of hockey - seasons in which the team will only get better and better - is going to feel like a pretty long funeral march. It’s not even just the team. How do we say goodbye to hockey? What is fall and winter without the skates hitting the ice, without the red lights, the air horns, the sound of boards rattling, the cursing of lost power play opportunities, the high fives? I can’t imagine greeting October without the anticipation of seeing my favorite hockey team on the ice. The Coliseum - if it still stands - will certainly live up to its nickname of the The Mausoleum. The closer it gets to 2015 and the end of the Islanders lease, the more it will feel like a burial ground. Each game, each season will bring us closer to saying goodbye to part of our lives. To the game, to the team, to the banners that hang from the rafters. In about two years, I’ll probably be moving from Long Island to Northern California (so, how are those Sharks looking?). I was going to say goodbye to the Islanders and the Coliseum anyway, but on my own terms. I’ll come back to visit them in 2015 for their farewell tour. I’ll wear my Islanders jersey and feel at home in the Coliseum because that place - no matter how crappy it may be on the inside - always feels like home. I’ll say my proper farewells and go back to California with “We’re all Islanders” tattooed on my heart. Because this team - the one that plays in Nassau County and not one that will play in any other place - will always be mine.